Brighton Township’s police work closely with our local school children to teach them about public safety as well as the grave danger of using illegal substances. The Brighton Township Police Department is located at 1300 Brighton Road in the Municipal Building. The department consists of the following: Chief of Police Howard Blinn, Captain Peter Benedict, two Sergeants, one Corporal, three patrolmen and several part-time officers. The Department provides twenty-four hour patrol coverage. All non-emergency calls to the department should be directed through the Emergency Services Center Dispatch in Beaver at 724-774-1789. All emergency calls are directed to 911. Click here to view the 2018 Annual Police Department Report. The Brighton Township Police Department is a certified and participating member agency of Project Lifesaver. This program is designed to help people in our community that have the tendency to wander and was created with two goals; to streamline search and rescue procedures and to help save lives. Designated officers of the Police Department have undergone an extensive training course covering Autism, Alzheimer’s, Down Syndrome and other cognitive conditions and are certified as electronic search specialists. Persons enrolled in Project Lifesaver wear a small personal transmitter around the wrist or ankle that emits an individualized tracking signal. If an enrolled client goes missing, the caregiver notifies the Brighton Township Police Department acting as the Project Lifesaver agency, and a trained emergency team responds to the wanderer’s area. Program participants have found that most who wander are found within a few miles from home, and search times have been reduced from hours and days to minutes. You can help with your donations. Each bracelet costs $300. The Department is now accepting donations to assist program participants with a financial need. If you wish to make a donation, please contact Officer Eric Schwartz at 724-728-1134 Ext. 207 or by email at eschwartz@brightontwp.org. Click here to see Officer Schwartz’ letter and program equipment cost to help you decide on an appropriate donation. If you are going to be away from your home for a period of time, the police department will make periodic checks on your residence while you are away. Prior to leaving, phone the department at 724-728-1134 with departure and return dates. Following a full day of activities during D.A.R.E. 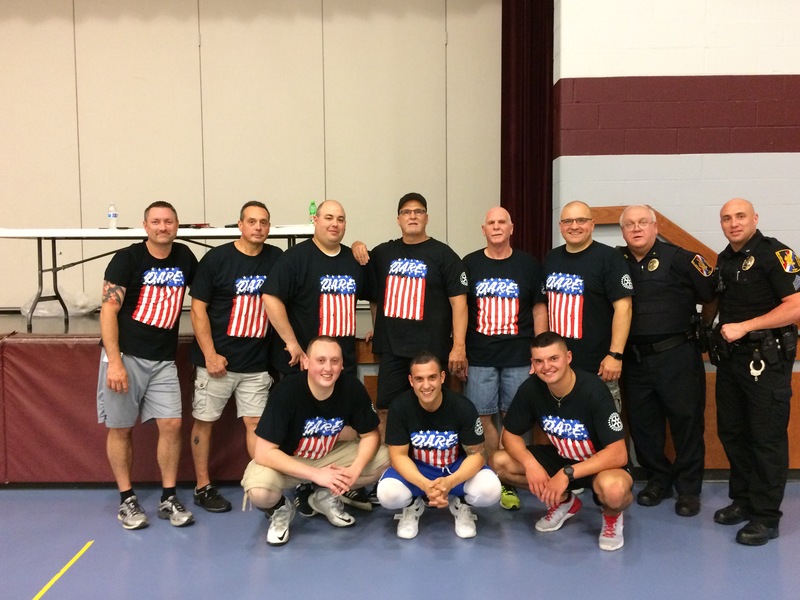 Days at the end of the Dutch Ridge Elementary school year, officers of the Brighton Township Police Department pose for a picture in the gymnasium. Kneeling: Officers Fabyanic, Rapko and Callaghan. Standing: Officer Sanders, Corporal Yates, Officer Schwartz, Chief Blinn, Captain Benedict, Dan Masura PA State Police, Sergeant Bernardi and Sergeant Gianvito. The Township would like to thank the staff, teachers and administration of the Beaver Area School District for their continued support of, and participation in, the D.A.R.E. program at Dutch Ridge Elementary School. At the year-end D.A.R.E. Days celebration students receive a Certificate of Completion and D.A.R.E. T-shirt. The Rotary Club of Beaver provided financial support through a cash donation towards the purchase of the T-shirts. 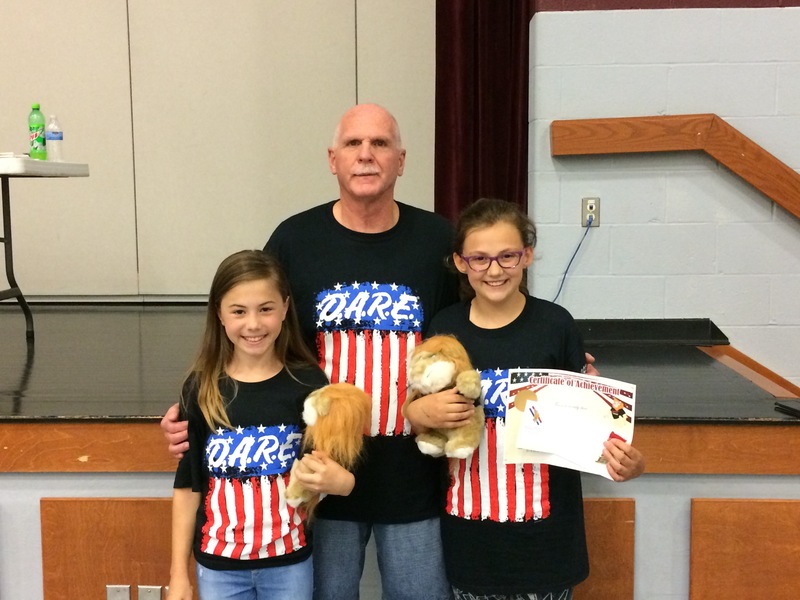 Captain Pete Benedict takes a picture with the D.A.R.E. award winners for the 6th grade at the Dutch Ridge Elementary School. Shown in the photo are Gianna Massimino (Best Overall Book) and Jocelyn Platts (Best Overall Essay). Congratulations on your awards! Captain Benedict is a certified D.A.R.E. (Drug Abuse Resistance Education) training officer and teaches the curriculum at the Dutch Ridge Elementary School. D.A.R.E. is a nationally-recognized program that gives kids the skills they need to avoid involvement in drugs, gangs and violence. The classroom lessons teach children how to resist peer pressure and live productive drug and violence-free lives. Beaver County Crime Solvers is used by local law enforcement agencies, including the Brighton Township Police Department, when a crime is committed and there are not eyewitnesses or suspect information. B.C. Crime Solvers posts the crime in various media in an effort to help solve crimes. Calls are made to a tip line, with the callers remaining completely confidential. Cash rewards are provided to callers providing information leading to an arrest for a crime committed in Beaver County. Funds are raised through donations, which are tax deductible. Check their website at www.beavercountycrimesolvers.com.